INTRODUCTION: We again make our bow to the public and present our Catalogue for the Season of 1897. 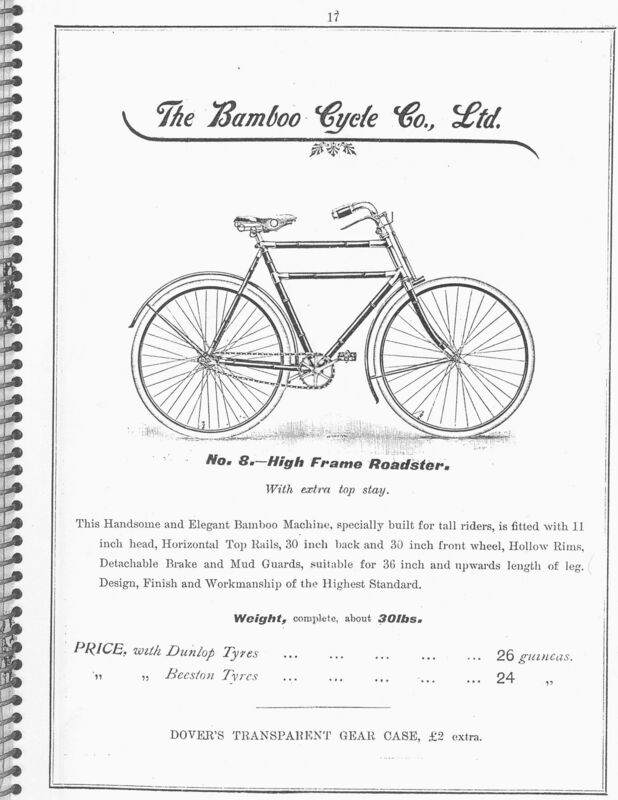 It is our good fortune on this occasion to acknowledge for the past year a record of trading that has thoroughly and permanently established the reputation of "Bamboo Cycles," and created a demand for manufactures that has at times strained the utmost capacity for our Factories to supply. This gratifying result has, we venture to assert, been solely attained by absolute sheer merit. Practical demonstration and not theoretical assertion has been the keystone to our efforts, and the success achieved warrants the assumption, to use a homely colloquialism, that the "Bamboo Cycle" has "come home to stay." It is our boast, that our patrons will find in our machines, the essentials to comfort, elegance and reliability, and we invite all lovers of the wheel to visit our City Showrooms, and there inspect our improved models for the coming season. The construction of our machines consists principally of three materials, viz. : Bamboo, Aluminium and Steel, by which combination we claim to have perfected a cycle that in strength, lightness, life and durability must render it more popular than ever ; while for ease and comfort in riding, absence of vibration, and artistic beauty of appearance, it has no successful rival in the whole of the Cycle World. 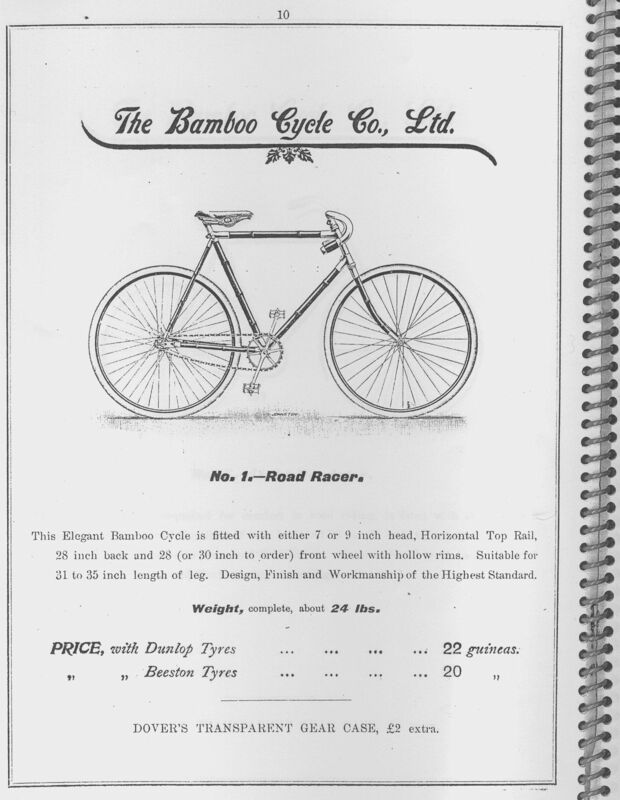 ref: Bamboo Cycle Co. Ltd. Catalogue p.2 . The machine which I purchased from you a little more than twelve months ago has been in constant and hard service ever since. It is as good as when it left your shops. Notwithstanding rough work during last winter and this autumn it is perfectly rigid, while there is no vibration. 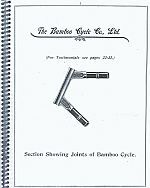 I have no hesitation in recommending the Bamboo Cycle as the best of the day. 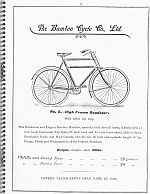 In reply to your letter of the 22nd Nov. which I found on my return home, I beg to say that I am more than satisfied with the Bamboo Bicycle which you supplied me with. I have ridden it a fair amount, frequently on rough and stony grounds, and it has yet shown no signs of ordinary wear and tear. I have recommended them strongly to several of my friends, and shall continue to do so when I am enquired of concerning them. I consider they possess several advantages over other machines, and certainly the appearance of them, in my mind, is better than that of steel machines. There still, however, appears to be a prejudice against them, but as far as my experience goes, it is an unfounded one. I believe they will stand every bit as much wear and tear, and are as strong as any on the market. 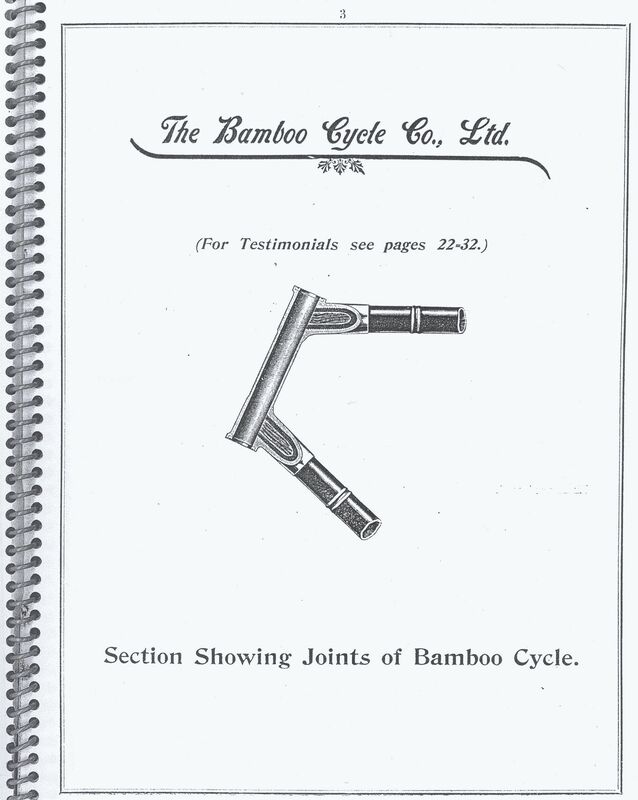 I have much pleasure in testifying to the excellence of your Bamboo Cycles. I have been a cyclist on and off for the last 20 years and I have never ridden a more comfortable machine. My Bamboo Cycle has been simply splendid, I have had it about nine months and it shows no signs of wear whatever. For perfect comfort I consider it cannot be beaten, and for appearance there is no machine in the market to touch it. The comments of those who have not tried them are most amusing. In reply to your question as to my opinion of the bicycle you supplied me with last spring. I can only say that it has given me every satisfaction. Weighing myself somehat over twelve stones I have carried on tour between 30 to 40lbs of luggage on one occasion 42lbs., and yet have never had any trouble. 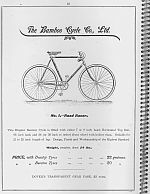 Indeed, your machine seems to me to have more life in it than a machine made wholly of steel and to absorb in some peculiar way the vibration or part of it generally experienced in ordinary bicycles. I may say I have ridden for many years, and now being the happy possesor of a safety by one of the best makers as well as my Bamboo, I am able to give them a fair trail and compare the one against the other. A large number of my friends also ride your machines and all speak of them in the highest terms. I have much pleasure in testifying to the excellence of your machines. 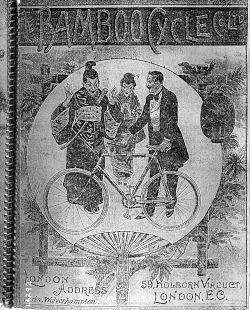 Before deciding upon your make I had great difficulty in choosing from the number of different bicycles advertised, and I am happy to state that I have had cause only for congratulation that my choice fell upon the Bamboo. It has been my constant companion when touring, both here and abroad, and I have made long journeys with no fatigue and great comfort. I can positively say it is the best machine I ever mounted. Should anyone be in doubt my advice is Buy a Bamboo.